Pulsars are the lighthouses of the universe; from here on Earth, the waves of electromagnetic radiation emitted by these incredibly dense neutron stars as they whirl rapidly about their axes resemble rhythmic pulses of light. The frequency of these pulses, and the intensity of their emission, varies from pulsar to pulsar. Now, more than 40 years after its initial discovery, astrophysicists have observed a neutron star pumping out radiation at energies far greater than current astrophysical models can explain. The neutron star in question is located at the center of the Crab Nebula — the brilliant, gaseous remnant of a massive supernova so bright, residents of Earth back in 1054 are believed to have been able to see it even during the daytime. The Crab Pulsar and its surrounding nebula are pictured here, in a composite image that comprises data from the Chandra X-ray Observatory, the Hubble Space Telescope, and the Spitzer Space Telescope. A team of astronomers recently observed the pulsar emitting gamma ray pulses with energies exceeding 100 GeV. As a point of reference, 100 GeV (that's 100-billion electron-volts) is a million times more energetic than your typical medical X-ray, and 100-billion times more energetic than visible light. So why is this observation significant? 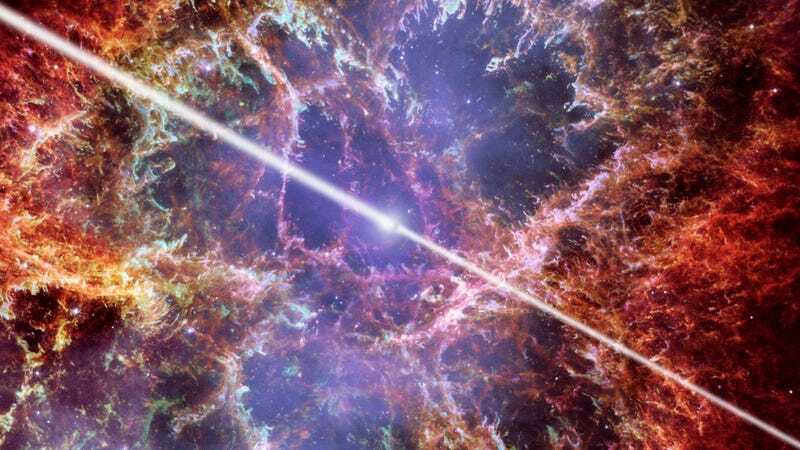 Well, for one thing, the Crab Pulsar and its surrounding nebula are among the most well-studied objects in space; the pulsar, discovered in 1968, was the first to be observed visually, and also the first to be connected with a supernova remnant, yet nobody had ever thought to look for emission energies in the range of 100 GeV. Why? Because it was considered impossible — looking for emissions at energies that high was thought by many to be a pointless endeavor. But Nepomuk Otte, a postdoctoral researcher at UC Santa Cruz, thought it was a great idea. Despite opposition from numerous researchers (Otte says that several of his colleagues told him he was crazy to look for pulsar emissions at such a high energy range), Otte pushed to lead a team of researchers to observe the Crab Pulsar at these presumably ridiculous energy levels. "It turns out that being persistent and stubborn helps," Otte said. If you asked theorists a year ago whether we would see gamma-ray pulses this energetic, almost all of them would have said, "No." There's just no theory that can account for what we've found. The researchers explore several scenarios that could explain the unprecedented observations in a paper published in today's issue of Science, but ultimately conclude that more observations — possibly requiring next-generation observatory equipment — will be necessary before any new pulsar models can be drawn up. For now, astronomers are left to ruminate on the game-changing results of an experiment that many thought should never have been performed. "To me it's a real triumph of the experimental approach, not going along with the flow and making assumptions, but just observing to see what there is," said astronomer Rene Ong, spokesperson for the VERITAS gamma ray observatory that was used to detect the Crab Pulsar's radiation. "And lo and behold, we see something different than what everybody expected."